Tags: Dog anxiety Medication, dog anxiety, dog Separation anxiety, dog Noise anxiety, dog Travel anxiety, dog Confinement anxiety, dog aggression, dog anxiety medicine, dog Separation anxiety medicine, dog Noise anxiety medicine, dog Travel anxiety medicine, dog Confinement anxiety medicine, dog aggression medicine, dog Nervousness, dog Hyperactivity Gold Vet Naturally Calm with L-Theanine. Relieve Aggressive Behavior Caused by Stress or Fear. Gold Vet Naturally Calm with L-Theanine 45ct is contains L-Theanine, Valerian Root, vitamins and minerals and amino acids specially formulated to safely soothe and calm dogs and cats during certain periods of elevated stress. L-Theanine (Suntheanine) is popular among those who seek natural-remedies and diets as a means to a healthy lifestyle. Suntheanine® is the purest form of L-Theanine, produced via a patented fermentation process that mimics the natural process in green tea leaves. L-Theanine has only recently become recognized in the west for its ability to calm without causing drowsiness and to reduce general stress, irritability, and anxiety. Studies have indicated that L-Theanine's effects are just as promising in dogs and cats. L-Theanine is an amino acid which increases GABA levels in the brain. Gamma-Aminobutyric acid, or GABA, is the chief inhibitory neurotransmitter in mammalian central nervous systems, responsible for regulating neuronal excitability throughout the nervous system. L-Theanine also increases the levels of dopamine, the brain's "reward" chemical, responsible for many positive feelings. The effects of L-Theanine are not instant, so chewable supplements containing it should ideally be given 30 to 40 minutes prior to the desired effect taking place. L-Theanine will then cross the blood-brain barrier to directly stimulate the production of alpha brain waves, creating a state of relaxation, and will stimulate the formation of GABA and Dopamine. L-Theanine differs from anti-stress herbs such as valerian root and kava kava in that it doesn't cause drowsiness. In fact, studies have demonstrated L-Theanine to promote mental clarity and focus and to enhance learning and memory, making it an excellent aid for training sessions. It will reduce nervous tension and many of the negative and destructive behavioral patters associated with anxiety in dogs and cats. It can be taken without food and at any time. I want to let you know about a great classified ad I have just found. This classified may be found at https://gsdsite.com/ads-3391/gold-vet-naturally-calm-with-ltheanine-relieve-aggressive-behavior-caused-by-stress-or-fear-.html. 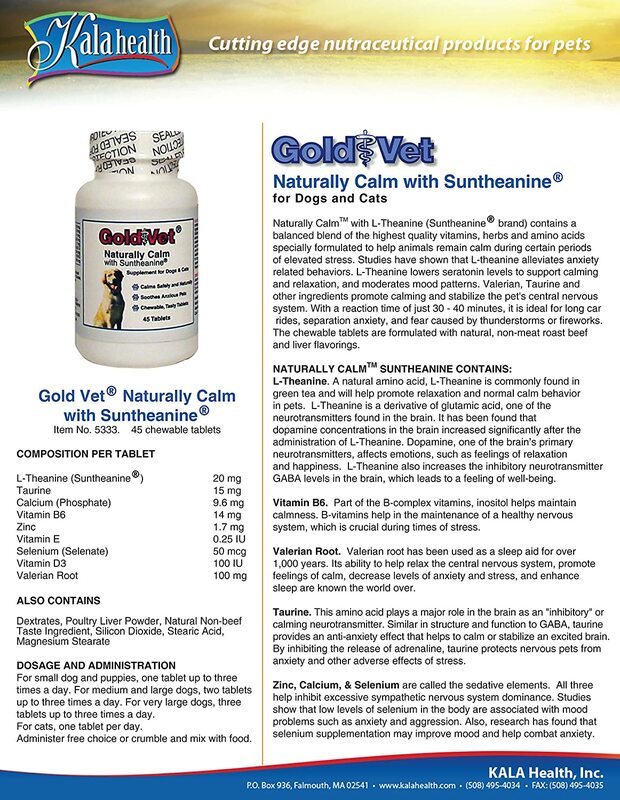 Title of the classified: Gold Vet Naturally Calm with L-Theanine. Relieve Aggressive Behavior Caused by Stress or Fear.